Some wrestlers who are defending Rep. Jim Jordan also say it would have been difficult for him not to hear the locker-room talk about Dr. Strauss. Former Ohio State wrestlers who say they were molested or made to feel uncomfortable by team doctor Richard Strauss disagree over whether their former assistant coach, Jim Jordan, turned a blind eye to the alleged abuse. Some say Jordan knew or should have known about Strauss' alleged inappropriate behavior, which they say ranged from long showers with the team to sexual abuse during appointments, because it was the talk of the locker room. Others maintain that Jordan would have protected them if he had known. 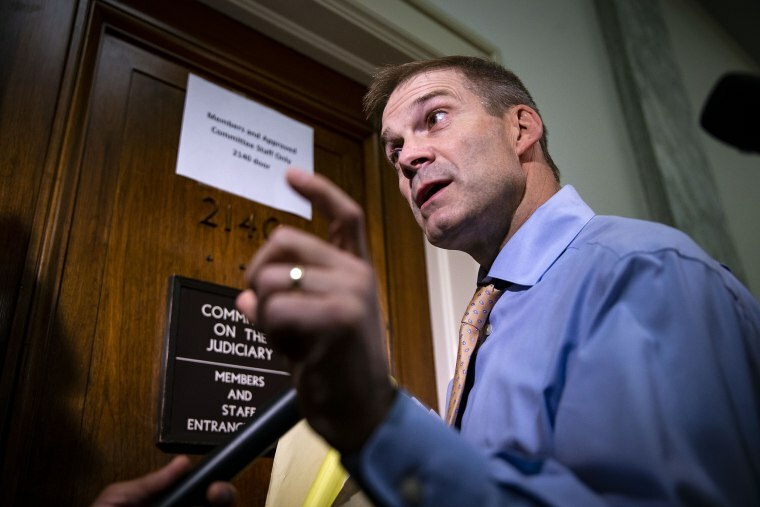 Jordan, now a powerful Republican congressman and staunch supporter of President Donald Trump, has admirers in both groups. But as Jordan firmly states that he did not know Strauss was allegedly abusing athletes when he was assistant coach at the university from 1986 to 1994 — and denies hearing locker-room banter about Strauss — former teammates who once cheered each other on are now at odds. Jordan’s defenders, though, say otherwise, including two former wrestlers who have spoken to NBC News. Ohio State announced in April that it was investigating accusations that Strauss, who died in 2005, abused wrestlers when he was the team doctor from the mid-1970s to late 1990s. Strauss's relatives released a statement saying the family was “shocked and saddened to hear the allegations of misconduct" against him. The prime mover behind the probe was a former wrestler and former Jordan friend named Mike DiSabato, who said Strauss groped him a number of times. He got other wrestlers and Hellickson to speak on video about the alleged abuse by Strauss and other inappropriate sexual behavior at Larkins Hall, where the wrestlers worked out. When asked about the OSU probe, Jordan denied knowing about Strauss abusing any athletes. The rift between the wrestlers appeared last week after DiSabato and two other former wrestlers told NBC News that Jordan was lying about not knowing what Strauss was allegedly doing. Since then, three additional wrestlers have told NBC News that while they admired Jordan, they were dismayed by his comments. And three more wrestlers, who spoke with other publications and whose accounts have not been verified by NBC News, have expressed similar sentiments about Jordan. Only one wrestler interviewed by NBC News has said he spoke directly to Jordan about the alleged abuse from Strauss. Four of the wrestlers who spoke to NBC News said that they believe Jordan would have tried to protect them if he had known the extent of the alleged abuse. But they say said it would have been difficult for their former assistant coach not to hear the jokes about Strauss in the locker room. Like many of the other wrestlers, Delman expressed admiration for Jordan and dismay at his insistence that he knew nothing. “It’s easy enough to say, ‘Looking back we should have done something,'” he said. Alf also said he never told Jordan about the “weird” physicals that Strauss subjected him too, but all the players went through the same thing. Still, Alf said, Jordan's adamant denials came up during a conference call last weekend with former wrestlers who were discussing how to support Jordan. “The guys didn’t blame Jimmy, but they were wondering why he didn’t just admit that he heard all the joking about Doc Strauss but didn’t put it together that something bad was going on,” Alf said. In an interview with Fox News on Friday, Jordan suggested his accusers were lying and that they might have political motives. He has been mentioned by conservatives as a possible replacement for Rep. Paul Ryan as the next speaker of the House. The suggestion that Jordan is a victim of a conspiracy is coming in part from a conservative public relations firm, Shirley & Banister Public Affairs, which has rounded up testimonials from more than 20 former Ohio State coaches and ex-wrestlers in support of the congressman. The firm has also created a #STANDwithJIMJORDAN website to promote pro-Jordan statements. In talking points sent to news outlets, Shirley & Banister pointedly went after Yetts and DiSabato. The firm noted that DiSabato had a legal battle with Ohio State after his Columbus, Ohio-based licensing firm lost its contract with the school. It also pointed out that Yetts served 18 months in prison for defrauding investors — a fact that Yetts earlier told NBC News in an interview. Former wrestler Mike Nutter, who made a name for himself on campus when he wrestled an actual bear, said that he, too, was victimized by Strauss but never told Jordan about it. “I know for a fact if I were to have told any of my coaches they would have run to law enforcement and fixed the situation,” he said. But what Strauss was allegedly doing in the locker room was widely known, Nutter added. “The guys had a nickname for Strauss: Dr. Jelly Paws,” he said. Jordan has gone on the offensive against CNN for reporting on the accusations against him, taking a page from Trump on Wednesday and describing the outlet as "fake news" in a tweet.